With the recent re-opening of the railway line from Metro Manila to Naga City in Camarines Sur, railway enthusiasts and old passengers alike have been quite excited about the prospect of finally having trains for travel between Metro Manila and the Bicol Region. I believe that the rehabilitation of the commuter line to the south as well as rail facilities all the way to Legazpi City, Albay should be prioritized especially considering that such services will provide a very attractive alternative to road-based or air transport. The recent donations of rolling stock from Japan are also encouraging developments though, of course, such trains are old models and may have already seen better days while in operation in Japan’s busy railway systems. Yet, with the way JR maintains its trains, these units should run for a few more years as long as PNR take care of them. A good source for the railway history in the Philippines, including the time when it was still known as the Manila Railroad Company. is the Philippine National Railways where one can also research on old photos and maps. There are also old reports relating operational matters as well as plans for the railways. A handy reference would be the work of Arturo G. Corpuz entitled “The Colonial Iron Horse: Railroads and Regional Development in the Philippines 1875-1935,” published by the U.P. Press in 1999. Copies of the book are still available with the U.P. Press at U.P. Diliman. 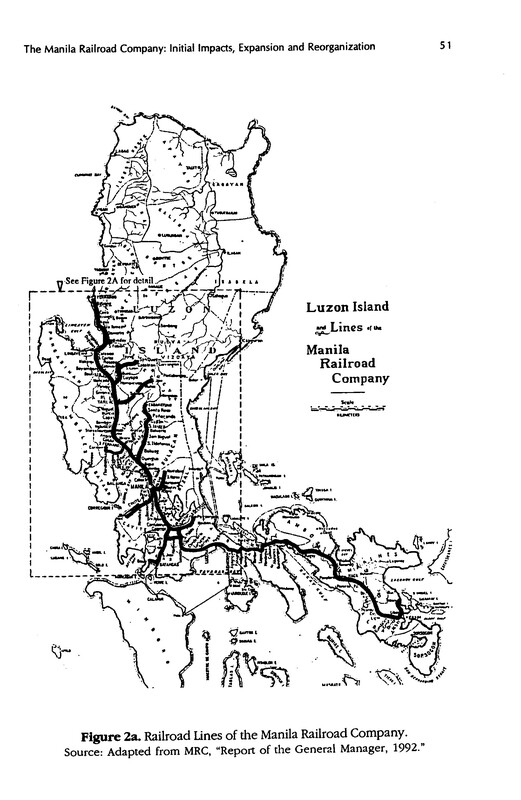 The Main Line North, which stretched from Manila to San Fernando, La Union for a total of 260 km, started construction in 1887 with the section until Dagupan starting operations in 1892. The section until San Fernando was opened in 1929. The Cabanatuan Line started from Bigaa, Bulacan and was completed in 1905 for a stretch of 9 km. The 6 km Camp One Line started from San Fabian, Pangasinan was opened in 1908 but was abandoned in 1914. It was reconstructed to Binday (now part of San Fabian) in 1937. The end of this line would have been a jump-off point for travelers heading to the “summer capital” of Baguio City. The Tayug Branch stretched from Paniqui, Tarlac to San Quintin, Pangasinan on the border with Nueva Ecija for a total of 29 km with the service to San Quintin opened in 1918. The Magalang Branch was a 9 km railway emanating from Dau and was opened in 1907. The Floridablanca Branch stretches from San Fernando, Pampanga to Carmen (now part of Floridablanca, Pampanga) over 20 km. The branch to Floridablanca opened in 1908 and the one to Carmen in 1919. The Arayat Branch also starts from San Fernando, Pampanga and ends the town of Arayat 20 km away. This opened in 1914. The San Jose Line was the last extension of the MLN from what is now Tarlac City to San Jose, Nueva Ecija through the town of Guimba and the now Science City of Munoz. The line stretched for a total of 55 km and was completed in 1939, just before World War 2 and the Japanese occupation. By d0ctrine in Infrastructure, Railways on October 14, 2011 .